Make Your Daycare Reservation Today! Interested in joining the HDS team? Email Resume to info@happydogspot.com or apply in person Monday – Saturday. Book your boarding reservations now! New to HDS? All dogs must past a temperament evaluation before booking a boarding stay. We are constantly posting lots of great pics of your dogs having a great time. Like us! Long time alone? Excessive barking or chewing? Let your dog burn off some steam and meet new friends! To ensure the health and safety of dogs in our care, each dog must meet specific enrollment requirements prior to making a daycare reservation. We provide a fun, safe place where your dog spends the day exercising and playing, then receives the royal treatment in the evening. To ensure the health and safety of dogs in our care, each dog must meet specific enrollment requirements and pass a temperament evaluation before booking a boarding reservation. The opportunity to become familiar with our staff and facility prior to an overnight stay encourages a positive experience and helps to reduce the anxiety sometimes associated with traditional boarding. Dogs scheduled for pick up after 9:00am Monday - Saturday will charged the Half Day Boarding Rate. Dogs scheduled for Sunday evening pick up will be charged the Half Day Boarding Rate. Additional Family Dog rate applies only when Family dogs share the same kennel accommodation. Happy Dog Spot offers a Trial Boarding Night of boarding to help to alleviate any anxiety you or your dog may have about boarding for the first time prior to an extended stay. Trial Night is scheduled Monday - Thursday by appointment only. Owner must be in town and available for pick up between 9 - 9:30pm if deemed necessary. Trial night dogs not picked up by 9am will be added to the daycare schedule and charged accordingly. Each dog must first pass the temperament evaluation and trial day of daycare prior to scheduling a Free Trial Night. Do you board your dog frequently for short stays? Purchase a 10 night boarding package for $430. Boarding packages expire 6 months from date of purchase. Boarding rates effective for Check-in after January 1, 2019. Let us give your dog a little spruce up after a day of playing or an overnight stay. Over 80 lbs and Giant Breeds are quoted on a case by case basis. Published bathing rates are only a guide. Actual charges may vary from visit to visit depending on length of coat, density of undercoat, matting, and dog's cooperation. Our De-Shedding Treatment takes the Full Service Bath & Brush a few steps further. Special shampoo and conditioner helps to release the undercoat and improve overall coat condition. Additional steps are taken throughout the bathing process to remove more of the undercoat and reduce excess shedding. At Happy Dog Spot, we want you and your dog to feel like family. You want what’s best for your dog, and we do too. Happy Dog Spot has watched over our two greyhounds since 2007. We have used the daycare and overnight boarding services regularly. We know our dogs are tended to personally as they love going there. The staff at HDS know the personalities and needs of our dogs and go out of their way to accommodate them and us… We are very fortunate to have found great friends and support at HDS. Keith W. & Carmen Q. We could not have found a more friendly, affordable place to leave our dog during extended family vacations. Happy Dog spot offers a clean friendly environment with lots of play time and space to run and play. The awesome staff is always friendly and caring with all the dogs and their owners. I always walk away assured that my dog will be well cared for as if she were one of their own. While we’re at work, it’s a wonderful feeling to know that our Yorkie dog is in a safe and secure environment. As he is a rescue dog, he is now much happier and healthier since coming to HDS. We can’t thank the staff enough for their time and attention they give him and us. He really enjoys his time there and is a very happy dog when he comes home after a busy day of play. Kairo is not only happy after his day at Happy Dog Spot, but he is thoroughly exhausted—he comes home ready to eat his dinner and naps while we eat ours! The staff at HDS have taught him to be more obedient, as well as his increased social skills with the other dogs give us total peace of mind. We LOVE everyone at HDS!! Genny gets so excited when we pull into the parking lot that she literally drags me up the stairs and runs into the back with hardly a backward glance at me. Tracy, Copper, Diane, and all the staff genuinely love our girl, and you can tell! She has stayed at HDS probably a couple dozen times, and I continue to be very pleased. We designed our 10,000 square-foot facility in Rock Hill to provide a clean, safe and enjoyable experience for all types of dogs. Our unique design allows dogs to roam freely between our indoor play area and our 3,000 square-foot outdoor area, while providing a comfortable space for older and less active dogs. We focus on lots of stimulating, interactive play for your dog. Game of fetch anyone? We personalize care at Happy Dog Spot. Every day, we create a play space for both active socializing and quiet relaxing. Our staff takes the time to get to know your dog’s personality and individual needs. We evaluate every dog to make sure Happy Dog Spot is a good fit, and create a personalized care plan that works for you and your pup. With certified veterinary technicians and experienced attendants on staff, we provide safe, structured care for dogs of all personalities and social skills. Stop by anytime to check out the fun! Is Happy Dog Spot is the right spot for you and your dog? Our staff includes professional trainers, certified veterinary technicians, and experienced attendants who love dogs and want to provide a great experience for your family. Our staff takes the time to get to know your dog’s personality and individual needs, then creates a personalized care plan that works for you and your pup. Since Happy Dog Spot owner Tracy was a little girl, she knew she wanted to work with animals. Growing up, her family had many pets: dogs, cats, guinea pigs, and other animals her mother raised in her kindergarten classroom. After graduating with a Bachelors degree in Biology from the University of Kansas, Tracy worked for several years at Washington University on the Human Genome Project. Her career then took her to Orion Genomics where the company focused on plant genomics and cancer diagnostics. As a program manager, she learned how to run a business while working with a strong team. But she did not stop thinking about her dream to work with animals. 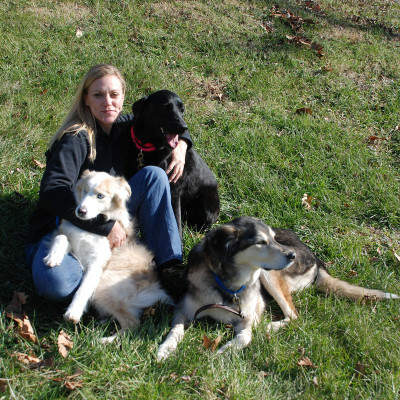 In 2007, she used her business experience, years of volunteering as a Veterinary Technician at a local animal hospital and her science background to open Happy Dog Spot. Her philosophy was simple: provide an open, caring environment for dogs using a great team of experienced staff. Tracy knows every dog has different needs. Some dogs want active, social play, some want quiet relaxation, and some want both! She designed Happy Dog Spot to fit most dog’s needs, with plenty of space to run around both indoors and out, and a quiet area for rest and relaxation. All dogs at Happy Dog Spot enjoy interactive, personalized care. She and the team take time to get to know every dog’s personality and design a daycare and boarding experience that works well for each dog. Tracy loves the Happy Dog Spot community, and the families have given back to her in times of need. In 2010, Tracy was diagnosed with breast cancer and underwent treatment. She is humbled and amazed at the support from her Happy Dog Spot families and friends. Tracy's black lab Maggie, though completely blind, often greets clients in the office with a happy face and a wagging tail. © 2019 Happy Dog Spot.